Investors infused $4.9 billion into automotive-related startups, nearly $2.5 billion into IoT startups and almost $1.2 billion into cybersecurity startups so far in 2018, according to Semiconductor Engineering’s estimates of private funding in the first six months of 2018. Popular investments included companies using artificial intelligence, big data analytics, blockchain, machine learning, and sensors to develop advanced automotive electronics, cybersecurity, and the Internet of Things. Many investors are ready to provide money to startups in these markets, as witnessed by the nearly $8.5 billion in private funding invested during the first six months of this year. Cybersecurity continues to be a major concern for IT and OT staffs, as the Internet of Things and Industrial IoT markets grow and more devices are connected to the Internet. Cybersecurity investments dollars hit a record high in 2017, driven by anxiety over data breaches—such as the massive breach at Equifax, which exposed the records of 145 million Americans—and the increasing sophistication of cyberattacks from around the world. So far, 2018 is lagging behind 2017, which saw 248 investments in the cybersecurity field totaling $4.06 billion, according to CB Insights. By comparison, private funding for startups in 2018 totals about $1.2 billion. Endpoint security is seeing heavy investment because the endpoint devices—phones, computers, point of sale devices—are often the most vulnerable link in any network. Also, a key to 5G use cases are endpoints interacting with edge computing. Servers will run calculations in real time on the edge of a network and communicating data and instructions with nearby endpoint devices. Self-driving cars may be endpoint devices in the near future. In June, the cloud endpoint protection company CrowdStrike received $200 million in Series E funding, while Cylance, which focuses on AI-based endpoint cybersecurity, raised $120 million. In May, endpoint cybersecurity and systems management company Tanium reportedly took in $175 million, although the company has yet to confirm that figure. 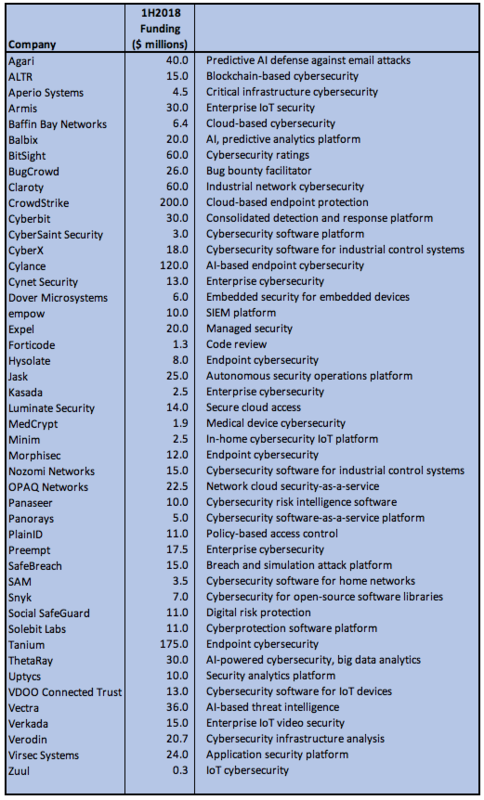 Table 1: Investors funded these cybersecurity startups for $1.2 billion in the first six months of 2018. Moving off the startup list are Carbon Black, Zscaler, Tenable, and Avast Software, which all became public companies in 2018. AT&T has agreed to acquire AlienVault, a cybersecurity startup, to bolster its portfolio of security products and services for its enterprise customers. Waltham, Mass.-based Carbon Black offers endpoint security with big data analytics through its Predictive Security Cloud platform and completed an initial public offering in May, raising $162.6 million. Zscaler of San Jose, Calif., another cloud-based cybersecurity firm, went public in March, raising $205.3 million in the IPO. Tenable completed its IPO in July, raising more than $250 million, while Israel’s Safe-T Group filed to go public in the U.S.
Also going public this year was Avast Software, a business and consumer cybersecurity vendor, which had an IPO on the London Stock Exchange in May. It raised $194.7 million. Internet of Things startups are still highly active in raising private funding, with many touting their artificial intelligence capabilities in this year’s IoT devices and networks. Blockchain technology is also becoming a popular feature in IoT products and services. C3 IoT, an industry “unicorn” specializing in Industrial IoT and AI, opened the year with a round of $100 million. More recently, Automation Anywhere—founded in 2003—took in $250 million in Series A funding from New Enterprise Associates and Goldman Sachs, among other investors. The robotic process automation enterprise, which has offices around the world, was once known as Tethys Solutions. Another big round went to Orbbec, $200 million, for its 3D motion sensing devices, one of which combines a 3D camera with an Arm-based computer. The first half of 2018 was a good time to be an artificial intelligence startup, especially if your company is based in China. SenseTime Group of Beijing this year took in $1.22 billion in two rounds of funding, with a billion-dollar investment from the SoftBank Vision Fund reportedly waiting in the wings. SenseTime’s products are used in facial recognition and the IoT, among other applications. Agricultural IoT (also known as precision agriculture) is a focus this year, along with home automation and security. Arlo Technologies, a unit of Netgear that makes Internet-connected security cameras, went public this summer. Table 2: Investors funded these IoT startups for almost $2.5 billion in the first six months of 2018. 2018 has been an especially good year so far for startups in automotive technologies. Faraday Future, an electric vehicle startup, received $2 billion in private funding at mid-year. Go-Jek and Lyft, two ride-hailing services, got $1.5 billion and $600 million, respectively. Pony.ai raised $214 million, while Roadstar.ai got $128 million; both companies are involved in autonomous driving. Turo, which is developing a peer-to-peer car-sharing marketplace, raised $104 million. 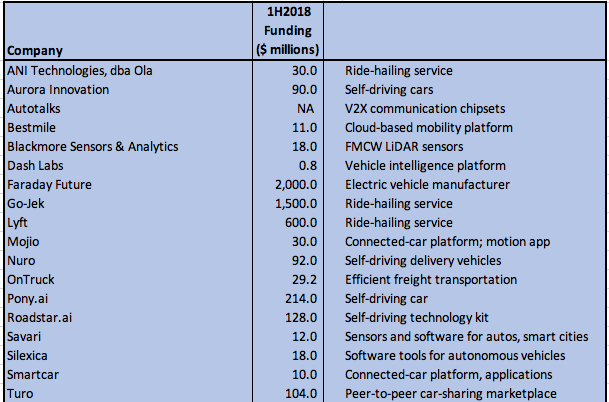 Table 3: Investors funded these automotive electronics startups for $4.9 billion in the first six months of 2018. Sensing perception technology is a very attractive area for investors, with the LiDAR field “especially hot,” the analyst says. Solid-state LiDAR sensors, often made with MEMS packaging, are being pursued by a wide number of startups. Innoviz, Suteng Innovation Technology (doing business as RoboSense), Luminar Technologies, Ouster, and AEye are among the crop of LiDAR startups making waves in the field, according to Hines. San Francisco-based Ouster came out of stealth mode late last year, announcing Series A funding of $27 million, led by Cox Enterprises. Also investing in Ouster were Fontinalis Partners, Amity Ventures, Constellation Technology Ventures, Tao Capital Partners, and Carthona Capital. Even with all of the LiDAR startup activity, Velodyne LiDAR “remains the standard,” Hines says. The company’s VLS-128 sensor represents Velodyne’s continuing efforts to improve LiDAR technology while shrinking the product’s form factor. “The specs look pretty good,” he observes. At the same time, work continues on advanced computer vision and radar technologies for automated driving. Frequency-modulated continuous-wave radar is taking the basic radar technology farther with its dynamic beam-steering, Hines says. Arbe Robotics and Metawave are among the contenders in automotive radar research and development. Israel-based Arbe raised $10 million in July in a funding round led by 360 Capital Partners, bringing its total private funding to $23 million. The startup will use the new funds to expand its market coverage in China. Metawave got $10 million in May from DENSO, Toyota AI Investors, Hyundai Motor, and other strategic investors to continue development of its millimeter-wave radar sensing technologies. A spinout of Xerox PARC, Metawave last year received $7 million in seed funding from Khosla Ventures, Motus Ventures, and Thyra Global Management, among other investors. “All three systems will coexist,” Hines states, referring to LiDAR, radar, and vision. Tesla is a LiDAR dissident, asserting that the technology is too expensive and unnecessary, he adds. When it comes to development of autonomous vehicle technology, software and testing (including simulation) are key elements in the field, Hines notes. More work needs to be done to “accelerate the validation process,” he asserts. Other technology trends in automotive systems to keep an eye on include infotainment system design, which is shifting from microcontroller-based to an apps processor-based system. “They’ve evolved to look more like mobile devices,” says Hines. Also, automotive OEMS are slowly moving away from a distributed architecture based on discrete electronic control units (ECUs) for performing specific functions to a more centralized architecture with fewer, but more powerful, chips. The shift in car architecture is coming but is developing slowly, however. “It does represent a wholesale change from what is in the cars today,” says Hines, which means challenges in how OEMs manage their product lines.